The U.S. aircraft carrier presence in the Persian Gulf will temporarily decline due to unexpected repairs and unusual maintenance problems. The U.S. aircraft carrier presence in the Persian Gulf will temporarily decline due to unexpected repairs and unusual maintenance problems, the Navy said on Wednesday. The USS Nimitz was expected to be deployed to the Gulf early next year to relieve the USS Dwight D. Eisenhower, which is now stationed in the region, but will be delayed due to the need for extensive repairs on a failed propulsion pump. The USS Eisenhower is being sent back to the U.S for repairs to its flight deck. It will remain in Norfolk, Virginia, for two months and then return to the Middle East early next year to complete its deployment. The Navy plans to send the USS Harry S Truman to the region early next year to restore the two-carrier presence. The USS John C. Stennis is already in the area. 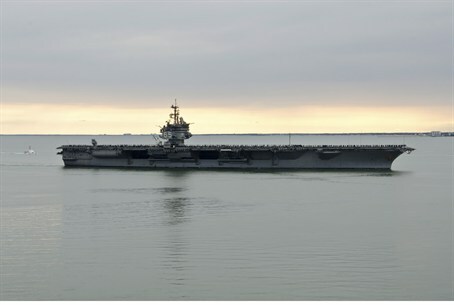 The gap will be the first time since December 2010 that the U.S. Navy has not had two carriers in the Gulf region for an extended period of time, as tensions with Iran continue to threaten the stability of the region.